FRESNO, CALIFORNIA, August 19, 2013… The Big Fresno Fair is proud to present the 2nd Annual “Spokes-N-Rods” event on September 28, 2013, which will benefit Terry’s House at Community Regional Medical Center. This motorcycle and car show event will feature the best hotrods, motorcycles, custom cars, antique cars and more from throughout the Central Valley – competing for top bragging rights and trophies – all part of this great fundraising event! The Big Fresno Fair is encouraging car and motorcycle owners to enter today to participate! Registration is only $25. There are multiple entry categories for cars including Street Rods and Modified, Roadsters, Trucks, Muscle Cars, Corvettes, Camaros, Race Cars and Special Interest. There are also a variety of bike entry categories including Rats, Choppers, Custom, Euro, Metric, Women’s Bike and Vintage. To enter, just fill out the application available at www.fresnofair.com/spokes-n-rods, then either fax it to (559) 650-3227, email it to lking@fresnofair.com or mail it to Lauri King at The Big Fresno Fair, 1121 S. Chance Avenue, Fresno, CA 93702. The public is also invited to attend and see the large array of cars and bikes on display during the event, as well as enjoy food, music and a live raffle. Raffle tickets are available for purchase now; limited quantities available. Raffle tickets are just $20 each for your chance to be entered-to-win $10,000 cash and a 2013 Harley Davidson Motorcycle. Vendor booths will be onsite with food and drinks available for purchase, as well as the finest products and services that any car or bike enthusiast would want. Admission is free for the public to attend. All proceeds from entries, vendor booth sales and raffle ticket purchases will directly support Terry’s House, which helps out-of-town families by providing them with a home-away-from-home while their loved ones are receiving critical care across the street at Community Regional Medical Center. Last year, “Spokes N Rods” brought out more than 6,000 people, 70 vendors and 200 of the Valley’s best hot rods and custom bikes. 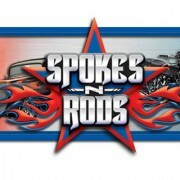 The second annual “Spokes-N-Rods” Event will take place on Saturday, September 28, 2013 at The Big Fresno Fair from 7 a.m. to 2 p.m. For more information on becoming an exhibitor or vendor, contact Lauri King at (559) 650-3228 or lking@fresnofair.com.